Hi! My name is Lisa Stallard, and I am the Buyer for European Brands. Want to know what’s in my bag? A whole lot of stuff! This is what I carry in my bag during a typical work week as a Buyer. Umbrella – Auckland has unpredictable weather, one day it’s beautiful and the next it is raining so I always carry a small umbrella with me so I never get caught out. Emerge Gold Sandals – I wear heels most days to work so I always carry a spare set of sandals in my handbag in case I need to head out to the shops and check out what is happening in retail. I love these Emerge Leather sandals, they are really comfortable and the gold and white straps go with everything. Microsoft Portable Phone Charger – My phone is always going flat during the day so this is a must in my bag. I’m always taking photos of the collections I am working on, or new product details, inspiration from retail and fabric development, you will also find me on the phone often talking to suppliers and factories. Ray Ban Sunglasses – On beautiful sunny days I can’t live without my sunglasses. Sometimes when the sun is out I walk across to the park and eat my lunch, my days are often filled with meetings, ranging the European collections and trading product so a quick break outside is a great way to clear the mind. Ecoya French Pear Hand Cream – My hands often get dry when I am working with clothes every day, so every morning I use my hand cream and I just love the smell – It’s always a good start to the day. Jo Malone Pomegranate Noir Perfume – I always have a bottle of perfume in my bag, it is nice to spritz yourself before a meeting or an event after work making you feel refreshed. MAC Red Ruby Woo Lipstick – I love wearing a bright bold lipstick, it pops a classic outfit and makes my face feel brighter. O.P.I. I’m Not Really a Waitress Nail Polish – My toes are always painted during the Summer as I often wear open toe heels. At the moment I am wearing O.P.I. I’m not Really a Waitress as it’s a bold rich red and is fun. Invisible Zinc Sunscreen – With New Zealand’s strong sun I always wear sunscreen on my face every day. I have recently discovered this new Invisible Zinc Sunscreen which is nice to wear and dries clear so I can wear it underneath my makeup. Notes and Scribble Notebook & Kikki.K Gold Spot Pen – I carry these two items everywhere with me during the day, my notebook it is filled with lists to do, range plans, marketing promotions and new ideas I am working on. Business Cards – I carry a bunch of these incase I am meeting a new suppliers, factories or a new brands on buying trips. We have four fun prints so its always nice handing these out to new people. Marc Jacobs Wallet – You can never leave the house without your wallet! It carry’s everything. I have had this wallet for years, it was given to me for a birthday and now the leather is all soft, I can’t part with it. Keys – House keys and work keys. The key rings are from Barcelona to remind me of my recent trip there, one is a memorabilia from Gaudi’s Cathedral and the other one is a Amethyst Crystal. 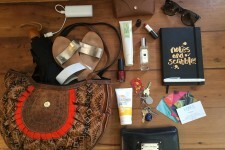 Yogi, Mother, Fashion Buyer: What’s in Rebecca’s Handbag?